We have begun posting updates about our staff and faculty on a new page! To continue following the recent updates about our staff and faculty, please click here. The George Washington University’s newspaper GW Hatchet published an article titled “Elliott School creates mandatory first-year course on leadership development”, a course professor Robert Sutter helped design. Jonathan Chaves published a chapter in the catalog for the Chinese Landscape Photography exhibit at the China Institute in America. See more HERE. David Shambaugh wrote a piece for the South China Morning Post entitled “Can Trump strengthen America’s influence in Asia during his visit?” Read it HERE. Mike Mochizuki wrote a piece for the Washington Post‘s Monkey Cage entitled “Three reasons why Japan will likely continue to reject nuclear weapons.” Read it HERE. 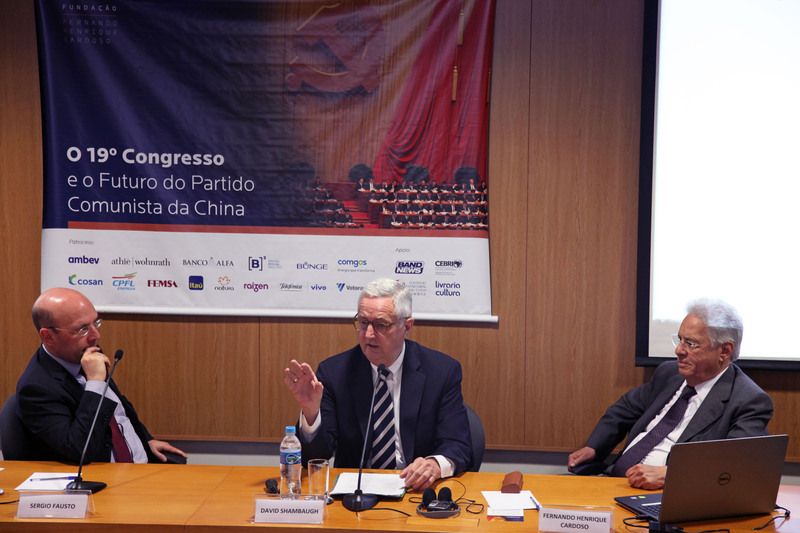 David Shambaugh spoke at a panel event at the Fernando Henrique Cardoso Foundation in Sao Paulo, Brazil on the Chinese 19th Party Congress. See a photo from the event HERE, with former Brazilian President Cardoso on the right and Sergio Fausto, executive director of the Foundation, on the left. Tashi Rabgey participated in the ICS/National Committee on U.S.-China Relations CHINA Town Hall with Ambassador Susan E. Rice, giving a talk entitled “Missing Territoriality: Tibet and the Governance Paradigm in the People’s Republic of China.” Read more about the event HERE. David Shambaugh wrote a piece for the South China Morning Post entitled “Reform or repression: what will the next five years bring for China?” Read it HERE. Bruce Dickson co-moderated a panel at the U.S.-China Social and Cultural Dialogue at the George Washington University. The event was sponsored by the Sigur Center for Asian Studies, Institute for Public Diplomacy & Global Communication, and the U.S. Department of State. Read more about the event HERE. David Shambaugh participated in an Intelligence Squared debate entitled “The U.S. and China Can Forge a Grand Bargain to Contain North Korea” during its event Unresolved: Face-Off with China. Watch the video HERE. Gregg Brazinsky was interviewed by the Wilson Center on US-China competition in the developing world. Read the blog post HERE. Deepa Ollapally wrote a piece on India’s progress towards great power status in India Abroad. Read the article HERE. Deepa Ollapally was quoted extensively on Indian Prime Minister Modi’s first meeting with President Trump in India Abroad. Read the article HERE. Edward McCord, professor of history and international affairs and Vice Dean of the Elliott School, wrote an article in The Diplomat titled “One China, Dual Recognition: A Solution to the Taiwan Impasse.” Read the article HERE. David Shambaugh, professor of political science and international affairs, wrote an article in The Korea Herald titled “China rethinks its global role in the age of Trump.”Read the article HERE. Deepa Ollapally was quoted in an article by United Daily News, one of the leading newspapers in Taiwan, regarding her presentation at a recent Sigur Center conference on Taiwan’s New Southbound Policy. The article is in Chinese, and can be read HERE. David Shambaugh was quoted in “China in period of transition” in The Star (Malaysia). Read the article HERE. Deepa Ollapally authored “US bombing of Afghanistan: Policy shift or just political grandstanding?” in Scroll.In. Read the article HERE. Robert Sutter was quoted in “Trump-Xi meeting watched for clues of future relationship” in The Associated Press. Read the article HERE. David Shambaugh was interviewed in The Straits Times about the upcoming Trump-Xi summit and US-China relations. Read the article HERE. David Shambaugh, professor of political science and international affairs, wrote an article in South China Morning Post on what to expect from President Trump’s first meeting with Xi Jinping. Read the article HERE.